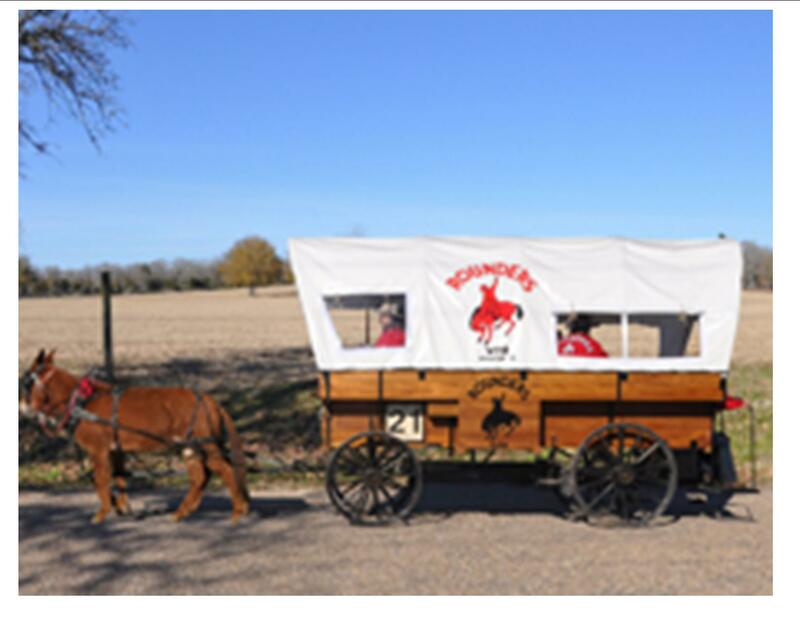 The Marks Family Wagon owned by 4th generation Marks, Kyra Vaughan Natho and 5th generation Marks, Lauren Natho Heard, was the original lone wagon that started with the first Salt Grass Trail Ride in 1952. On that ride were E.H. Marks, Assistant Trail Boss and wagon owner, Reese Lockett, Trail Boss from Brenham, Pat Flaherty, of Houston’s Channel 2 who served as Wagon Boss, and John Warnasch, who was Mr. Marks’ ranch foreman and served as the first muleskinner for the Salt Grass Trail. Currently, 3rd, 4th, 5th and 6th generations of the Marks family actively participate in the ride. Kyra and Lauren continue to carry on the legacy of the original riders especially honoring their Great Grandfather, E.H. Marks. The Marks LH7 Legacy Riders have served as lead wagon since that first ride and has never missed a day on the trail. E.H. Marks’ children, Atha Marks Dimon, Maudeen Marks, and Travis Marks, have participated in the ride since the early years. Atha Marks Dimon participated in the ride until her passing at age 99 on Christmas Eve of 2009. She started riding in 1953 and never missed a ride. She was known to all of us as Mother, Grammy and Ms. Atha. She was a great example to us all as a Salt Grass Trail member and a lady. Our goal as a family is to continue to promote agriculture, the Houston Livestock Show and Rodeo™ and our family’s legacy of western heritage and the SALT GRASS TRAIL RIDE. A Marks Family Wagon owned by 4th generation Marks, Kyra Vaughan Natho and 5th generation Marks Lauren Natho Heard. 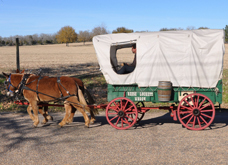 This wagon was added in 1954, which preceded the information of the chartered association and was to carry the bedrolls, tents and other supplies necessary for the ride. Maudeen Marks (Daughter of E. H. Marks) was one of the first riders and owned Wagon 2 for many years. She handled the publicity for the Salt Grass Trail Association for many years and was even known to stand in the river bed to report the progress of the ride. Among many other accomplishments and contributions, Maudeen is responsible for the song, “Riding Down the Salt Grass Trail” being written and is now sung during the ride. It can certainly be said that Maudeen was one of a kind and the mold was broken when she was made! She was a colorful and poetic person. Maudeen Martha Marks is no longer with us and will always be remembered as a great asset to the Salt Grass Trail Association. Reese Lockett, a Salt Grass Trail Ride founder, added his wagon to the ride in 1954. At that time, the group was known as the Brenham Wagon, later to be designated the Reese Lockett Wagon. Breakfast and dinner meals are still cooked over an open campfire in accordance with Mr. Lockett’s wishes. In the fall of 1962, Mr. Lockett passed the wagon on to Frank Lenich, asking that he carry on the tradition and originality of the group for as long as possible. Don Hildebrandt is a former Salt Grass Trail Boss who still serves on the SGT Advisory Board. Houston Livestock Show & Rodeo™ President and Chief Executive Officer Joel Cowley is the Honorary Trail Boss of the Salt Grass Trail Ride. Show officials and dignitaries ride with the Houston Livestock Show & Rodeo™ Official Wagon each year. This wagon appears nightly in the Show’s Grand Entry. The Salt Grass Trail Ride opens the Houston Livestock Show & Rodeo™ each year. Circle S joined the Salt Grass Trail in 1954 with Jack Frost, Buck Conner, and Carl Smith. Carl Smith was brought in to make Wagon 5 the official Harris County Wagon, as he was in office as the Tax Assessor, and the wagon was named Circle S in his honor. Wagon 5 has approximately 40 riders. Kendall Stephanow is the wagon’s youngest rider. C.B. Roberts has ridden the Salt Grass Trail since 1954. Wagon 5 is proud to recognize 3 past Salt Grass Trail Association Trail Bosses. I.H. Perry, C.B. Roberts and David Smith. 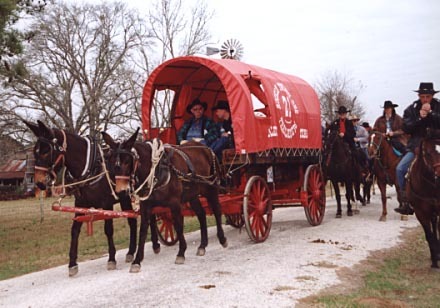 The Houston Livestock Show & Rodeo™ Trail Ride Committee selected Wagon 5 as Best Wagon in 2001. C.B. Roberts and David Smith continue to serve the SGT on the Advisory Board of the Executive Committee. 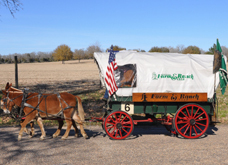 Official wagon of the Houston Farm & Ranch Club. The original purpose of the Houston Farm & Ranch Club was to promote agriculture and ranching in the community. Everyone associated with this wagon is a member of the Houston Farm & Ranch Club. The Magnificent Seven joined the Salt Grass Trail Ride in 1984. The group has about 100 riders and has hosted a number of distinguished guests over the years, including Dr. Red Duke, Senator Kay Bailey Hutchison, and former Texas State Comptroller John Sharp, News anchor Shara Fryer, former Texas Secretary of State Jack Rains, and Constable Bill Bailey who was one of the original founders of Wagon 7. Distinguished members of the group include Johnny Montalbano, Don Jordan, Joey Pedigo, Roy Elledge, John Burns, Mike Johnston and Carolyn Faulk. Longtime riders include Dennis “Magoo” McIinnis, Dozier Partlow, Gary Brown, Angela Montalbano, Sandra Montalbano, Dan and Tammy Johnston, Gary and Dee Dee Trichter, Michelle Mascari, Nowery Smith and Pam Wren. 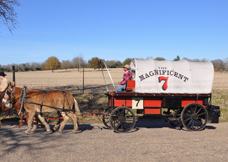 The Magnificent Seven wagon has won Best Appearing Group in the Houston Livestock Show and Rodeo™ parade multiple times. Two of our members have been honored in the past, Butch Hart won Top Trail Horse on “Smokey” in 2011 and Pam Wren won Top Trail Rider in 2014. We are honored to be represented on the Salt Grass Board by two of our own members, Dan Johnston as Assistant Trail Boss and Jody Wren as Chuck Wagon Boss. Vincent Montalbano and Matt Devine represent Wagon 7 as Salt Grass Trail Scouts. Lazy 8 was formed by eight members of the Harris County Sheriff’s Posse, Dude Parmley, Frank E. Mann, George Cook, Jack White, Dr. R.D. Ward, George Allhouse, Ed Hallmark and Frank Trent. At the time, Dude Parmley was the Captain of the Posse. Dude Parmley served as Trail Boss for the Salt Grass Trail from 1973-1975. The Lazy 8 Wagon has participated in and contributed to the Salt Grass Trail Ride for over 50 years. Wagon 8 has won Best Show Wagon and Best Appearing Group for the Houston Livestock Show & Rodeo™ Parade 12 times. Group members have won Youngest/Oldest Rider Awards and Farthest Distance Traveled Awards many times. Dude rode horseback every year on the Salt Grass Trail until he joined the Riders in the Sky in 2007. Riders representing Wagon 8 for the Salt Grass Trail are John Parmley a Lifetime Scout and James Williams who serves as Scout. 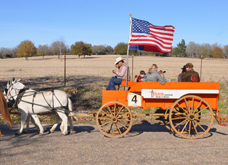 Wagon 9, Austin County Trail Drivers, has made the Salt Grass Trail Ride since 1955. Gene Beckendorff named the wagon after the home county of the Beckendorff family, who has worked cattle in the area since the 1800s and drove cattle on the Salt Grass of the Southeast Texas Plains for winter pasture. The group has 48 riders led by Wagon Boss Jimmy Beckendorff, who has made the ride since 1967. John Heineike is the oldest rider. Milton Beckendorff currently serves as Chairman of the Executive Committee for the Salt Grass Trail Association. He has made the Salt Grass Trail Ride for 54 years, longest of any Austin County member. selected James and Jerilu Goetzman to lead the group. The Goetzman’s purchased the equipment, and Wagon 10 has remained a family group of riders that enjoy friendship and camaraderie. Jerilu has made the Salt Grass Trail Ride for more than 30 years and held the Executive Offices of Scribe with the Salt Grass Trail from 1990 to 2002, and Public Relations and Special Events Chairman from 1979 to 1987. Wagon 10 has produced two Salt Grass Trail Bosses: Herman Roth (1985-1987) and James Goetzman (2003-2005). Mr. Roth participated in the Salt Grass Trail Ride until his death in July 2002. Charles Merian won both Top Trail Rider and Trail Horse while he was a member of wagon 10. Charles’ wife, Marsha Merian, also won Best Trail Horse and Cheyenne Hirsch received the Youngest Trail Rider in 2003 and 2004. James and Jerilu’s other granddaughter, Taylor, will soon to be following her grandparent’s footsteps along the trail. Fred Chapman was the founder and original owner of Wagon 11, “Are You Lazy Two”. Mr. Chapman rode his first Salt Grass Trail Ride in 1953, and never missed a ride until his death in June 2002. 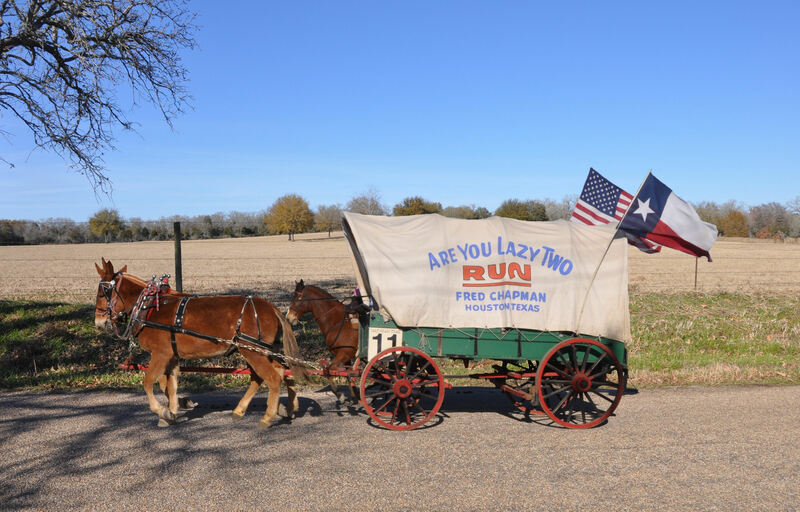 Chapman’s grandson, David L. Meador, continues the tradition as Wagon Boss for Are You Lazy Two. Chapman’s son-in-law, David P. Meador, was Trail Boss of the Salt Grass Ride in 2000 to 2002, then served as the Chairman of the Executive Board and currently serves on the Board of Directors’ Advisory Board. Some riders say it is not the same without Fred, who always spun a yarn, told tall tales and kept everyone in line. “If you saw him comin’, you’d better start runnin,” say some group members. The wagon has about 30 riders. Wagon Boss, Delphine Merkel has made the Salt Grass Trail Ride for more than 40 years, longest of any Are You Lazy Two members. The wagon name, “Are You Lazy Two” was Fred Chapman’s way of making a point about trail rides – You can be lazy and enjoy the ride with a lifetime of memories…there’s no reason to get in a hurry. Ray Holcomb started Wagon 19 in 1992. Most of the group’s 35 riders come from Manvel area. Holcomb is the group’s oldest rider and has made the Salt Grass Trail Ride for more than 40 years. Wagon 19’s youngest rider and future Wagon Boss is Robert Dungan, Robert Burn’s Grandson. Robert Burns, the group’s Wagon Boss and mule skinner took over Wagon 19 from Ray Holcomb in 2002. Robert was awarded the Salt Grass Trail Ride’s Top Trail Rider award for 2004. Wagon 19 proudly shares their horses in activities helping special needs individuals throughout each year. 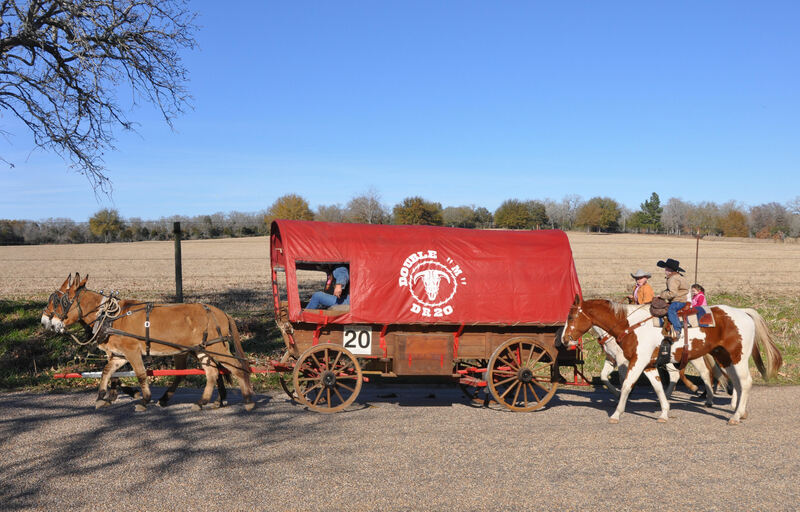 The Desperado wagon has been on the Salt Grass Trail Ride for more than 30 years. The Desperados have welcomed distinguished riders including Welcome Wilson, chairman of the board of regents for the University of Houston, former Houston Chief of Police Harry Caldwell and “The Virginian”, James Drury. Gary Smith is driving the buggy with other distinguished guests. The Desperados have won many awards over the years, including Best Appearing Wagon for the Houston Livestock Show & Rodeo™ downtown parade in 1981, 1982, 1984, 1988, 1998, 2000, 2002, 2003, 2005 and 2010; and Best Show Wagon in 1995, 1997, 2003, 2008 and 2014. Desperados won Best Wagon on the Salt Grass Trail Ride in 1981, 1984 & 1986, and 2nd Place in 1985. In 1985, Archie “Pa” Bennett, Sr. was awarded the Oldest Male Rider for the Salt Grass Trail. Wagon 14 joined the Salt Grass Trail Ride in 1960 founded by Elmer Hooper. The Group was originally named the “Rough Riders”. 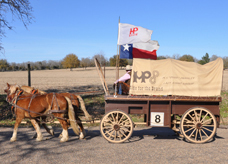 Later, Elmer’s nephew, Jimmy Hooper and wife Mickie took ownership of the wagon, changing the name to “Rockin 21”, dedicated to the memory of Elmer Hooper, who proudly wore button number 21 on the Salt Grass Trail Ride. 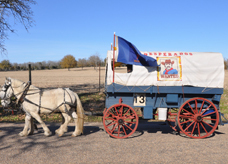 In 2014, Jeff Eubanks purchased the Wagon and changed the name back to the “Rough Riders”. Jeff leads the group as Wagon Boss, along with Assistant Wagon Boss, Steve Urban. Jimmy and Mickie Hooper are still active members of the group and still own the famous team of mules. Jimmy will hand over the reins this year for 2016 to our friend Rick Gilbert as our mule skinner.. In the past, the wagon has won the honor of Salt Grass Trail Best Looking Wagon. They have about 20 to 25 riders. The Rough Riders are laid back and an easy going bunch! The Texas Outlaws, previously the Pasadena Wagon, joined the Salt Grass Trail Ride in 1982 under former Wagon Boss Bubba Baker. This group of 45 riders comes from all over the state of Texas. The group’s oldest rider is Bobby Schrock, and Jonathan Klepetko is the youngest Texas Outlaw. Distinguished member Marilyn Demontrond has ridden the Salt Grass Trail for more than 35 years, the longest of any member of the group. 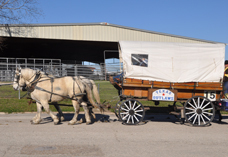 The Texas Outlaws’ wagon name originates from the spirit of the members – they are open to new adventures and never back down from a challenge. The Broken Wheel Riders joined the Salt Grass Trail Ride in 1962 under founding wagon boss Foster McKnight. The wagon was then passed down to Donald “Duck” Belyeu, who had ridden since 1964. In 2008 he handed the reins over to his daughter Lisa Ahrlett. This tight-knit group of approximately 40 riders comes from all over Texas every year to ride the trail and catch up with their “trail ride family”. Their riders have truly forged a family-like bond that would have been impossible to form without their dearly missed Riders in the Sky: Foster McKnight, Donald Belyeu, Dawn Belyeu and Pam Belyeu Buckmaster. The group’s youngest riders are 5 year old Cooper Massar and 3 year old Marshall McLain. Their best aged rider is Mrs. Pat Fendley, who hasn’t missed a ride since 1968. Broken Wheel has had the same wagon and name since they started in 1962, and they have never missed a year on the trail. The name Broken Wheel has suited them well over the years as they have ridden through a couple of rides and even a parade with a real broken wheel, but thanks to Duck’s ingenuity they never let it stop them from completing a day’s ride! The Brazos River Riders joined the Salt Grass Trail Ride in 1972, and have not missed a ride since. They have approximately 40 members. Kathleen Klausmeyer, John Phillips, Karen Klausmeyer, Kurt Klausmeyer, Philip and Doyleen Fairchild, and Tom and Sally Hakemack have all been members of the Salt Grass Trail Ride for more than 40 years. Tom Hakemack served as Chief of Scouts from 2002 to 2005. Sally Hakemack has served on the Salt Grass Trail Ride Executive Board as Public Relations and Special Events Chairman and currently serves as Scribe. Philip Fairchild has served as Route Boss on the Executive Board and currently serves as Assistant Trail Boss. Also riding with them are scouts, Wesley Martin, Joe Diez, and Rusty Sillivan. 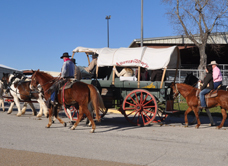 Brazos River Riders participate in many parades and trail rides throughout the year. 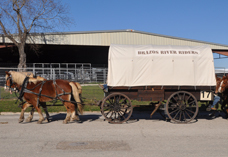 Our wagon name originated from the Brazos River, which is the boundary between Waller and Austin Counties where most members reside. Our awards include Top Trail Rider: Kurt Klausmeyer (1996), Top Trail Horse: Travis Hakemack riding “Mandy” (1997), Tyler Klesel riding “Rebel” (2013), Kurt Klausmeyer riding Blue Duck (2016); Youngest Riders: Phyllis Fairchild (1985), Dustin Cope (2000, 2003, 2005, 2008) Tyler Klesel (2007, 2008, 2009), Ronnie Lee Thrasher II (2009), Morgan Thrasher (2010), Hunter Hinze (2013), Heath Hinze (2014, 2015, 2016, 2017). 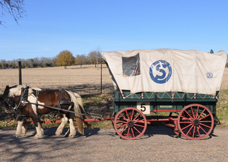 The 59 Independent wagon joined the Salt Grass Trail in the early 1970s, and the wagon’s history goes back farther than any of its present members. The wagon has 20 riders, led by Wagon Boss Buddy Jones. 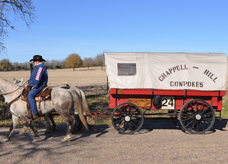 Don Carpenter is the wagon’s oldest rider, and Melody Aldridge has made the ride for more than 30 years, longer than any other wagon member. Brice Schriner is the group’s youngest rider. The group’s name originated from the founders of the club. They were all from North US 59. Independent is a state of mind. Wagon Boss Buddy Jones and Assistant Wagon Boss Shane Linnell drive the team of mules, but group members joke that when Buddy drives, the mules are usually in charge. The Long Neck Riders joined the Salt Grass Trail in 1979. The wagon now has approximately 50 riders, the oldest being Don Humphrey. Poncho Dismukes is the longest riding member, having made the Salt Grass Trail Ride for more than 30 years. The Long Neck Riders have won several awards along the Salt Grass Trail, 2nd Place Best Wagon in 1982, 1st Place Best Wagon in 1983 and 3rd Place Best Wagon in 1984. They also won Best Appearing Wagon for the Houston Livestock Show and Rodeo™ Parade in 1982. The Long Neck Riders have had 6 Salt Grass Trail Top Trail Riders: Rueben Mikeska in 1989, Poncho Dismukes in 1990, E.C. Kennedy in 1992, Joe Landry in 2008, Brett Schroeder in 2010, and Chad Dismukes in 2011. The Long Neck Riders have had 2 Salt Grass Top Trail Horses: Mercedes in 2010 Owner Larry Davis and Scarlet in 2012, Owner Kristi McBride. Along with being the founder of the Long Neck Riders, Poncho Dismukes currently represents the Salt Grass Trail Executive Committee on the board of directors. Charlie Morgan and his father, Floyd Morgan, rode the Salt Grass Trail Ride on horseback with Julias Collier from Tomball for many years. Floyd Morgan wanted to drive his own wagon, so Charlie purchased the wagon for his dad in 1975. Floyd was able to fulfill his dream and drove the Double “M” wagon for the 1975 Salt Grass Trail Ride before he passed away in August of that year. Charlie takes pride in honoring his father’s wish by keeping the wagon on the Salt Grass Trail all these years. At 85, Charlie is the group’s oldest rider, and his great-grandchildren Morgan, Colton, Wyatt, EJay, Jacob, Corrina, Cheyenne, Ella, Cash and Declan represent the fifth generation of the Double M tradition. In 1981 the “Double M” won the Best Wagon award, and in 2001, Mitch Morgan was awarded Top Trail Rider. Charlie and his son, Mitch Morgan, have ridden the Salt Grass Trail together for more than 40 years. Charlie represents the Salt Grass Trail Ride as the Ambassador of Goodwill, and served as Chief of Scouts for many years. His son, Mitch, carried on the tradition by serving as the Chief of Scouts for 6 years. This was the first time in the history of the Salt Grass Trail that a father and son held this position. Mitch is representing the Salt Grass Trail as the Trail Boss for his 2nd year. Jeremiah “JJ” Horn, son-in-law of Mitch Morgan, and Richard Horn take great pride in representing the Double M as Lt and Sgt. Scouts for the Salt Grass Trail. The “Double M” name comes from Floyd Morgan and Charlie Morgan. “Double M” will be extended to represent Mitch Morgan and his son Cam Morgan in future years. DR-20 is a symbol added in 2005 in honor of Dusty Rhodes, a lifelong friend to the Morgan’s, and a fellow Sgt. Scout representing the “Double M” wagon on the Salt Grass Trail. Dusty Rhodes’ horse D-9 was awarded Top Trail Horse in 2005. Double M has have many of “youngest rider” awards and is very proud of all their awards winners! Frank Majorwitz, Billy Baichtal, Fenton Hauck, Ron Johnson, Jeff Lehmann, and a few other Salt Grass Trail riders founded the Rounders in 1973 with the purpose of promoting western heritage, friendship, and fellowship and preserving the past while preparing for the future. The group was called the Rounders, after the expert horsemen who rode out to round up stray cattle in the days of the American cattle drives. The Rounders have contribute to and participate in numerous charitable trail rides and events each year, including Fort Bend County’s Trail Ride for the Autism Foundation, the Fort Worth Frontier Days Pony Express Roundup for Autism, the Gary Gene Schroeder Memorial Trail Ride in Anderson and “Adopt a Hero” for our wounded soldiers. The Rounders’ Annual Shane Harris Memorial Poker Ride, held the first weekend of October in honor of one of the Rounders’ Riders in the Sky, benefits a scholarship fund for aspiring firefighters attending Fire Training School at Texas A&M University in College Station. 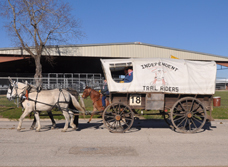 In more than 40 consecutive years of riding the Salt Grass Trail, the Rounders have won numerous awards, including Best Wagon and Best Showmanship. Two Rounders have won Best Trail Horse awards – Jaynie Carrens on “Sundance” in 1986, Stan Moss on “Toro” in 2002 and Lynne Cantrell on “Blanco” in 2015. Youngest Girl Rider awards were presented to Ashley Johnson in 2001 and Hali Belcher in 2002. In 1991 & 2004, the Houston Livestock Show and Rodeo™ Parade Committee voted the Rounders Best Appearing Group. In 2005, Jeannine Templeton was recognized as the Most Knowledgeable and Experienced Woman of the Salt Grass Trail. In 2009, Dave Young from Livonia, NY won the award for Furthest Traveled inside the US. The Rounders are proud to recognize three past Salt Grass Trail Bosses, James Goetzman, Bill Henry, and David Smith – as they were, and continue to be, part of the Rounders Family. Established in 1984 with only 10 riders, the Chappell Hill Cowpokes are a great group of about 45 members. Parents and children, brothers and sisters, aunts and uncles, as well as many friends, participate as one BIG family in this group. The Cowpokes do not meet a stranger! 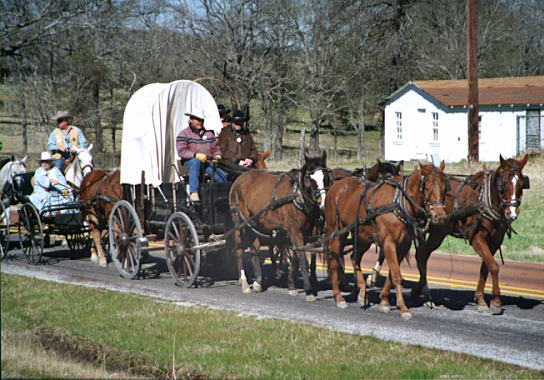 The name of the wagon originated from the fact that a number of the charter members actually resided in historic Chappell Hill, Texas. ‘Cowpokes’ then added just the right touch to complete the name. The Cowpokes’ oldest rider and Charter Member, Tom Kubeczka, has ridden the Salt Grass Trail Ride for 53 years. Chappell Hill’s many distinguished riders include: 2008 Top Trail Rider – Joe Landry; 2010 Most Experienced Female Rider – Joy Seidel; 2010 Top Trail Rider – Brett Schroeder; and 2011 and 2016 Oldest Male Rider – Tom Kubeczka. Cowpoke Terry Shupak and Joe Landry also represent the Salt Grass Trail Ride as Scouts who safely guide us down the trail. Other Charter Members include Lisa Stark Kaspar, James Kubeczka and Steve Wahrenberger. Carrying out the tradition, the following Cowpokes made the original SGT Ride out of Brenham, TX at one time or another: Tom Kubeczka, Gary Ladewig, Steve Wahrenberger and Butch Hegemeyer. 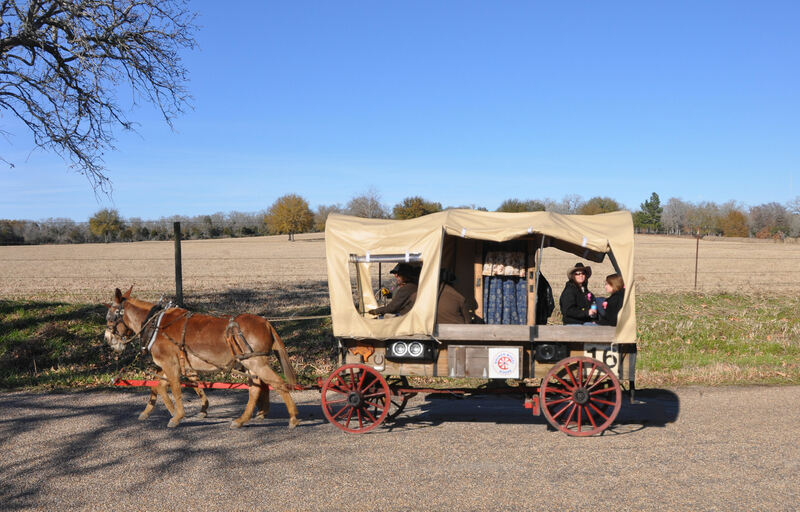 The Texas Legacy Riders is the newest wagon on the Salt Grass Trail Ride. The name was chosen to honor the amazing legacy and memory of those that are gone but certainly not forgotten. The wagon will be “Riding in Memory of Jody Wren” and others for whom the Salt Grass Trail Ride was an integral part of their lives. Pam Wren’s husband, Jody, was serving on the Salt Grass Executive Board when he left us to become a “Rider in the Sky”. Pam purchased the wagon from long-time Wagon Boss Dickey Davis. Dickey has ridden as the Wagon Boss for the Monaville Bandits for the last 40 years and is a former Trail Boss. As an active member of the Executive Board, he will continue to ride with this new adventure. Pam has partnered with Chris Miller, Michelle Crite and Bridget Reid-Wood. All of the Bandits’ riders will remain and there will be new additions to take this wagon down the trail. Iron Horse Guest Ranch wagon is the newest wagon on Salt Grass Trail Ride. In 2016, Alex and Niki Henson purchased the wagon from a gentleman in Colorado because of its special modifications. The wagon is equipped with an electric wheelchair lift along with removable seats giving it the ability to accommodate up to 4 wheelchairs. Dustyn Henson, their oldest son, who uses a wheelchair, loves trailrides and wanted to be included in the family adventures. Iron Horse Guest Ranch wagon enjoys giving rides to veterans, people with disabilities, and their families. Our country’s veterans are very near and dear to the hearts of Iron Horse. Alex Henson served for 9 years in the United States Navy as a SeaBee. Alex and Niki Henson’s younger son, Caleb Henson is a 1st Lieutenant in the Waller High School Airforce JROTC program, volunteers at Texas, Children’s Hospital, and helps work on the family ranch. Iron Horse Guest Ranch Riders is a unique group composed of riders of all ages. Many of the riders are a part of the Wrangler training program where they learn to become the equivalent of lifeguards on horseback. The Wrangler training program includes horsemanship, first aid, cpr, and emergency management training. They regularly do drills to keep their skills current. The wagon also has their own scout team used in WarmUp rides and charity events. Many of the Iron Horse Guest Ranch Riders are members of the Mounted Search division of First Priority Search And Recovery, a 501c3 organization, where Niki Henson is the Equestrian Coordinator. The wagon is pulled by a team of Belgian mules, Bob and Bill. They were purchased together as half brothers, Amish trained, and worked in the mountains of middle Tennessee. Bob and Bill were featured in a Hollywood movie, “Stroke of Genius”. They have been working pulling multiple Iron Horse wagons in Texas since 2016. They love sandwiches and getin’ their ears scratched. In 2017, the wagon won a “best wagon” award on the Montgomery County Scholarship Trail Ride.